by David R. Griffin, author of The New Pearl Harbor – Disturbing Questions about the Bush Administration and 9/11 and The 9/11 Commission Report: Omissions and Distortions — A Critique of the Kean-Zelikow Report. Many people have said that this Report “reads like a novel.” It is indeed surprisingly good when judged in terms of criteria appropriate to works of fiction. But the 9/11 Commission was supposed to conduct a serious investigation into the question of who was responsible for the attacks of 9/11. Instead, it simply presupposed the official conspiracy theory, according to which the attacks were planned and carried out solely by al-Qaeda. The Commission entirely ignored all evidence for the alternative conspiracy theory, according to which the attacks succeeded only because of complicity by members of the US government. 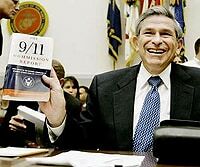 Having written a book that summarizes much of the evidence supportive of this alternative theory (“The New Pearl Harbor: Disturbing Questions about the Bush Administration and 9/11”), I read “The 9/11 Commission Report” to see how it handled this evidence. I found that it simply omitted most of it and distorted the rest. For example, the Report simply repeats the official story about the 19 Arab hijackers, failing to mention that at least six of the named men have shown up alive. It even suggests that Waleed al-Shehri, who visited the US embassy in Morocco after 9/11, stabbed a flight attendant on AA 11 before it hit the North Tower (page 5). This sloppy scholarship proves to be no aberration. With regard to why jet fighters failed to intercept any of the flights, the Report provides a radically revisionist account of 9/11. Claiming–in contradiction to the timeline provided by NORAD on September 18, 2001–that the FAA never notified the military about Flights 175, 77, and 93 until after they crashed, the Report fails to explain why NORAD had earlier said otherwise. This new timeline also changes the starting times of all the teleconferences, in order to claim that they could not have been the means for the military to have learned about the hijackings from the FAA. Also, to bolster the claim that the shootdown order was not given until after Flight 93 had crashed, the Report also contradicts by 45 minutes all prior testimony–including Secretary of Transportation Norman Mineta’s eyewitness testimony to the Commission itself–as to when Vice President Cheney descended to the Presidential Emergency Operations Center. With regard to the World Trade Center, the Report fails to mention that fire had never caused steel-frame high-rise buildings to collapse. It also, by way of suggesting why the Twin Towers could have collapsed so easily, says that the core of each building consisted of “a hollow steel shaft” (541n1), whereas in reality the core of each consisted of 47 massive steel columns. While mentioning that the South Tower collapsed in 10 seconds (305), the Report otherwise fails to mention the fact that the collapses manifested 10 standard features of controlled demolitions. The Report handles the collapse of Building 7, which even FEMA admitted it could not explain, by simply failing to mention it. With regard to the Pentagon, the Report fails to mention that the West Wing would have been the least likely target for terrorists, that its facade did not collapse until 30 minutes after the strike, and other facts in tension with the idea that the Pentagon was struck by Flight 77. And while claiming that al-Qaeda operatives did not strike a nuclear plant for fear that their plane would be shot down (245), the Report fails to point out that the Pentagon is even better protected, so that any aircraft without a military transponder would have been automatically shot down. With regard to the FBI, the Report fails to mention many stories that are damaging to the official account of 9/11. These omitted stories include attorney David Schippers’ report that several FBI agents told him of their advance knowledge of the New York attacks, the complaint by Coleen Rowley (Time magazine person of the year) that FBI headquarters sabotaged the Moussaoui investigation, and the damning allegations made by FBI translator Sibel Edmonds in her 3.5-hour testimony to the Commission. What about the allegation by Craig Unger (popularized in Michael Moore’s “Fahrenheit 9/11”) that the White House authorized a private flight carrying Saudis on September 13, before private flights were otherwise allowed? The Report “refutes” this allegation by simply saying that US airspace had been reopened at 11 AM that day (329, 556n25), thereby ignoring the crucial distinction between commercial flights, which were then allowed, and private flights, which were not. The Report also provides radically ahistorical accounts of the attacks on Afghanistan and Iraq, ignoring all the evidence that these attacks were motivated by desires to establish military bases and to take over the oil (rather than by desires to protect human rights and promote democracy). In this and other ways, the Report omits all evidence that the Bush administration had plans of the sort that could have provided motives for allowing or even engineering the attacks of 9/11. I have documented these and dozens of other problems in my book The 9/11 ommission Report: Omissions and Distortions. These problems are so great that the Report, instead of being nominated for a National Book Award, should be designated a National Disgrace.